As part of a special brain-tissue study, a group of researchers from Columbia University Medical Center made an extraordinary discovery when they examined the brain tissues of children with autism. According to researchers, the study revealed that the brains of the children studied had an excess of synapses, the structure that permits a neuron to pass an electrical or chemical signal to another neuron. Researchers believe that autistic children may not undergo the regular synapse pruning process during early brain development. The research paper in which this information is based on was published in a journal called Neuron. The study also revealed potential genetic targets that may lead to further treatments for autism spectrum disorder (ASD). According to researchers, a drug called rapamycin was shown to reduce autism-related behaviors in mice. It is the team’s hope that a medication similar to rapamycin, as there can be significant side effects, can be administered to a child or an adult with autism in the future. The idea that excess synapses may be the cause of autism had been revealed in the past, but it has only recently been studied. Synapses allow the neurons to communicate with each other through an electronic or chemical signaling. To test this hypothesis, Dr. Guomei Tang, a researcher from Columbia, analyzed the brain tissues of 26 children, ages 2 to 20. Thirteen of the children were between two and nine years old when they perished. Another thirteen were between the ages of 13 and 20 years old when they passed away. Dr. Tang compared these to the postmortem brain tissue of 22 children and adults who did not have autism. Dr. Tang inspected the number of synapses found in a small section of the cortical tissue taken from every brain of every child. It was evident through the neurons that children with autism had more synaptic “spines” compared to the control group. It is believed that these synapses were damaged and they had not been wiped off by autophagy. Cells go through autophagy for breaking down components and these include synapse connections. Autophagy is controlled by a protein known as mTOR. Children with autism have been observed to have overactive mTOR. This protein prohibits the autophagy from cleaning the area and disposing the damaged synapses. Another observation by Dr. Tang was that during late childhood the density in the brain tissue not affected by autism decreased to half. In contrast, there was only a 16 percent decrease in the brains of those who had the condition. Ralph-Axel Muller, a neuroscientist at the San Diego State University, said that it was evident that there was an over-connectivity based on brain imaging studies he conducted. He added that the impairments seen in children with autism may seem like the different parts of the brain are talking too much. The leader of the research team, David Sulzer, replicated the condition among mice and provided them with a drug, suppressing the mTOR. The result was that there was a balance in the mTOR function and some of the extra synapses were pruned off. Ultimately, this led to reduced display of ASD-associated behavior. The drug however is not yet ready for human consumption. Sulzer said that the fact that changes in behavior were observed suggests that it may be possible to treat autism after a child is diagnosed. The discovery of extra synapses among the brains of children with autism is incredible, but what is instrumental to treating the condition is the observation that mTOR affects the numerous genetic causes of ASD. Sulzer further added that having overactive mTOR, decreased autophagy, and abnormal synaptic pruning that may be the underlying reasons for learning the appropriate behaviors can be considered the unifying features of autism. 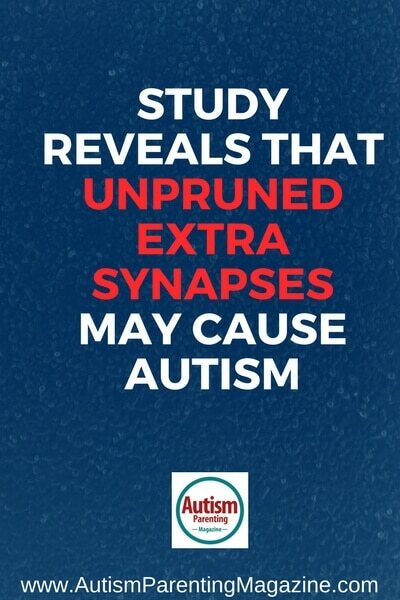 This study is highly significant since ASD affects 1 in every 68 children born in the United States.